Tyler Gorman/Staff Photographer Students play games such as blackjack, beat the dealer and roulette inside of the College-in-the-Woods Dining Hall during the 42nd-annual Casino-in-the-Woods. 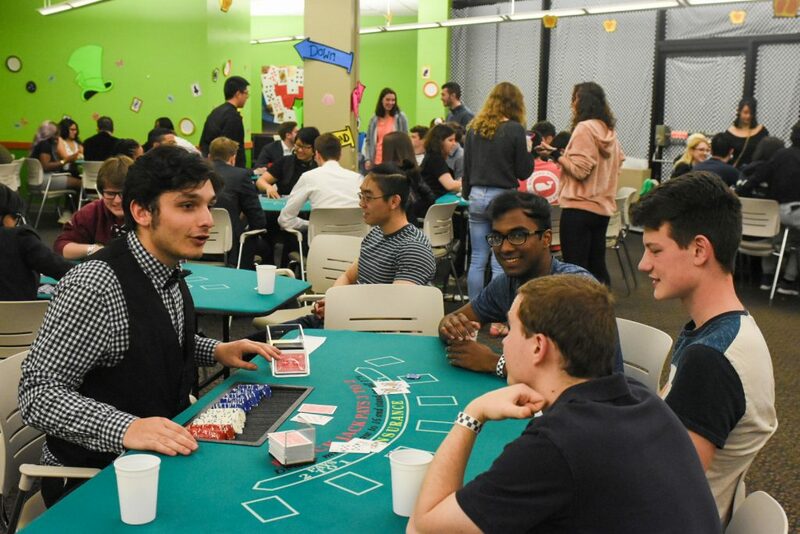 Binghamton University students gathered inside the College-in-the-Woods Dining Hall on Saturday night to gamble — the one night of the year they can do so on campus. Transforming into a real, licensed casino from 7 p.m. to 1 a.m., the 42nd annual Casino-in-the-Woods featured games like blackjack, beat the dealer, roulette and money wheels, where students could win real money. Run by the College-in-the-Woods College Council, this year’s Casino-in-the-Woods was held to raise money for the Detention Alternative After-School Program (DAASP). The program is offered to those between the ages of 12 and 16 by the Broome County Probation Department and by Broome County Family Court and assists in increasing positive decision-making, reducing repeat offending and improving school performance. Kristen Seward, president of the College-in-the-Woods College Council and a sophomore majoring in philosophy, politics and law, helped plan and coordinate the event. Seward wrote in an email that it’s difficult to pick a charity to donate to every year, but the Council agreed it was best to give the money to a local organization. The dining hall was decorated in casino and Alice in Wonderland ornaments, the theme for this year’s event. The dealers for the games were students who had undergone formal training in running gambling games. Entrance was $3 and students were met with free food and refreshments. Nia Brown-Fonrose, a dealer at the event and a sophomore majoring in biology, said this was her first time being a blackjack dealer. To obtain the temporary gambling license for the event, Seward had to meet with Vestal officials to discuss her reasons for requesting a license. Next, a number of forms had to be filled out and submitted to Vestal Town Hall. Once it was approved, the forms were forwarded to state and county officials, and after Seward paid a fee, a temporary gambling license was granted. Seward said the event allows students to give back to the community. “My philosophy behind [Casino-in-the-Woods] is that if we are going to live here for at least four years of our life while we attend school, it is important to give back to the community that made it all possible,” Seward wrote. Brian Kissmer, a senior majoring in biology, said he had attended Casino-in-the-Woods before and appreciated the cause behind it.